Barnett thought about improving its Vengeance model and created this particular crossbow that takes everything the previous model did good and made it better, plus something on top. Among the most significant improvements that must be mentioned as means for introducing this model to bowhunters, the new riser for increased speed, the better arrow retention feature, as well as the Trigger Tech technology used for eliminating dry fires are among the most important. Without further ado, let’s see what makes the Barnett BC Revengeance a good option for someone who wants a reliable crossbow for hunting elk or deer. The Revengeance was built to sustain a lot of wear and tear, which is why it is so heavy, and it should come as no surprise that this is not the kind of weapon you should pick up if you’re not a pretty strong individual yourself. But, as always with heavy crossbows, there are certain upsides to it, and that is what we are going to talk about here. For starters, the components are made from stainless steel, and that means that rain and fog will not be a problem for this model. You might have to put some strength into carrying it around, but any weather conditions will not cause rust or corrosion to appear. Seeing that a warranty of five years covers the crossbow, that means that it will withstand the test of time. The flight track is also made from machined aluminum, to ensure that you will get a durable and sturdy crossbow that will accompany you in your hunting adventures for years to come. We already mentioned earlier that this model is a redesign of a previous crossbow made by this company. But, while the several improvements that we will talk about a little more later on have a serious impact on the speed and accuracy of the bow, you may notice that the overall design is not that much changed. The CRT riser is there to limit the total weight of the crossbow, especially since it is already quite a heavy model, at 8.4 lbs. Don’t count on the Revengeance to have a slim profile, either. From axle to axle it has 18 inches, and that when cocked, which means that you might use it conveniently when you’re using a tree stand, but walking around with it might prove to be a burden, especially if you are not particularly strong from a physical point of view. One thing that we need to note about this model is that it is quite balanced. Unlike other models that tend to be front heavy, this one has its center of gravity in the middle, which provides more comfort to the user. So that might compensate for the heavy weight. Also, the reversed draw contributes to the excellent balance of the crossbow, and you will find it quite enjoyable to use. An extra benefit is the fact that your shots will get steadier, too. 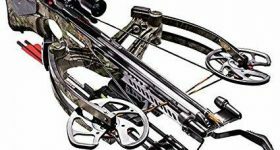 The reverse draw system is just one of the aspects that make this crossbow such a good pick for someone who wants to increase his or her accuracy when hunting. One of the most useful features that you will find on this model and you couldn’t find on the previous model with the same name is the Trigger Tech. This system comes with a zero creep trigger, which means that you will ‘feel’ your crossbow when shooting. The nock sensor included eliminates the risk of dry fires, so that is why we are inclined to believe that this model is not such a bad choice for a novice. It must be noted that a wide range of accessories is included with your purchase. For instance, you get a 4×32 illuminated scope that will give you the necessary edge when you must shoot in less than ideal light conditions. 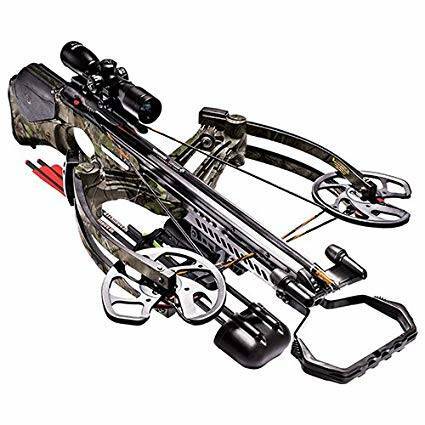 Seeing that it is quite a heavy crossbow with a draw weight of 145 lbs, you will surely make good use of the rope cocking device that is provided with the package. You will also get two Headhunter arrows, and a quiver, which pretty much means that you’re good to go. It is a great thing that the manufacturer also thought about including some lube wax with your purchase to make sure that you have everything necessary for maintaining your crossbow in top-notch condition. Lubing the strings is recommended once every ten shots. Crossbows can be noisy if they don’t have a noise dampening system in place. That is the reason why we dedicate one section of this review to the particular features that the manufacturer uses to ensure that your crossbow will remain silent once you start shooting. In this case, there are string dampeners included which will do a good job to reduce the vibrations and to eliminate the possible noise. The Revengeance is a pretty cool crossbow you can use, especially if you plan on using a tree stand or a large hunting blind. It comes with plenty of nice extras, and it is fast, at 400 fps, and accurate. For elk and deer hunting, it is an excellent pick.